When life gives you lemons, you’re supposed to make lemonade. When your press car suppliers give you two 400ish horsepower SUVs, you make hoonade. The recipe? Take equal parts Jeep Grand Cherokee SRT8 and Infiniti FX50s, stir vigorously on a pre-dawn canyon drive, whip mercilessly on the semi-abandoned roads of California City, and let simmer on a long freeway drive home. While most other sites are content to review just one vehicle at a time, we’re running them head-to-head. In addition to the typical week of toodling around town, we decided to put these bruisers through their paces both on and off the pavement. We woke up insanely early and took the scenic curvy canyon route out of LA out to California City for a little dirt-road hoonage. Muscle cruisers like these are useless if they can’t cover freeway mileage with ease, so we took the straight-line route back into town. 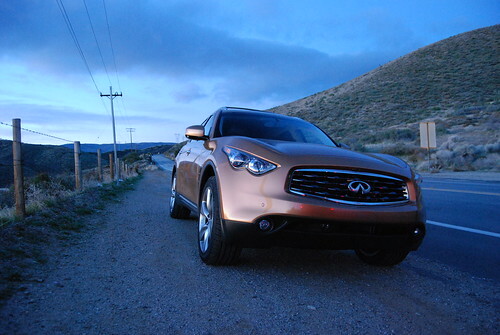 Today’s Part I will focus on initial impressions an canyon driving. 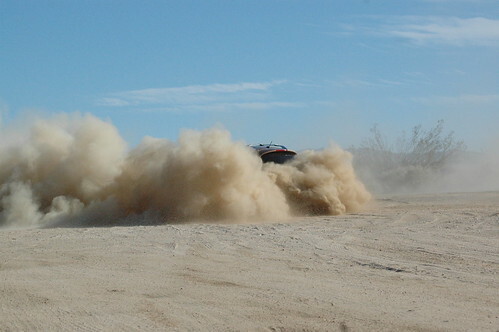 In Part II, we hit the dirt. Part III wraps it up. Tim: I picked up the bionic catfish at night. The orange looked classy in the dark, the streetlights reflected off of its curves, the 390hp 5.0L V8 burbled to life gracefully, and the well-appointed interior treated me just right. The next morning, when I showed it to The_Missus in the glaring sun, all she could say was “guuah!“. Such is the FX50s. Not unlike high fashion, sometimes the shape and styling work, sometimes they (really) don’t. Mildly appealing is not an option. 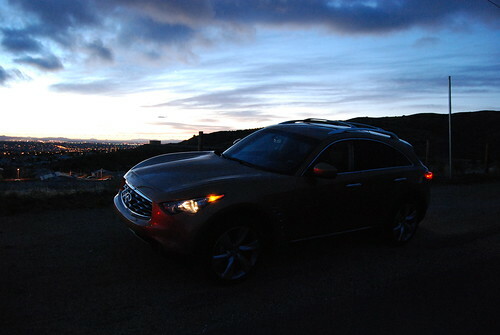 After spending a few days getting used to the FX, I knew it made great noises and handled impressively for a crossover. 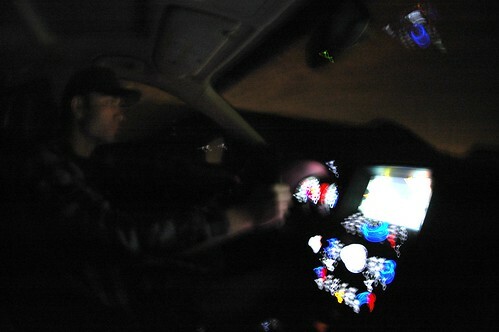 But after flogging it through the canyons, I moved from impressed to astounded. The steering’s weighty and precise and the seat bolsters can be cranked to Overzealous Grandma Hug. Visibility’s great. Body roll? What’s that? One complaint: The upshifts from the flappy-paddle 7-speed auto were slow enough that I couldn’t get from 2nd into 3rd quick enough on the exit of a sharp corner. After a few too many rev-limiter bounces while waiting for a shift, I just gave up and left it in 3rd the whole time. Turns out it wasn’t that big of a deal anyway, as the 5.0’s rarely short on power, regardless of RPM. 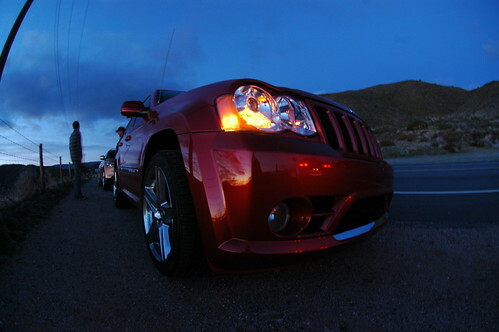 Rob: Climbing into the Jeep Grand Cherokee SRT8 I was first struck by how low the thing is. 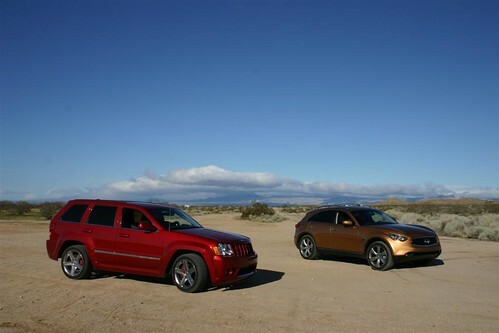 The trail-rated Grand Cherokees are all hiked up like a tortoise traversing a patch of prickly pear, but the SRT8 is hunkered down like it’s hiding something. A flick of the keyless key and you find out just what that is. The Jeep’s 420-bhp 6.1-litre hemi V8 spins to life with an unearthly growl, scaring near-by children and causing old women to cross themselves. There’s no mistaking the muscle car lineage when dropping the shifter down into D (no fussy gates or flappy paddles here) and put a toe into the go button. The first time I did it, I was doing 30 before the ‘wow’ had even escaped my lips. With a little practice, I could launch it in a manner that wouldn’t cause respectable folk to raise an eyebrow over, and that wouldn’t alert the po-po. But in an impromptu drag race, dropping the hammer brings upon God’s own fury and I managed a 4.9 second sprint to sixty if the amazing toy in the dashboard is to be believed. The 5-speed autostick shifts with authority and, while you can slap the shifter back and forth like it’s Faye Dunaway in Chinatown, it’s a little difficult to do so when the brutal acceleration is slamming you back into the big leather and alcantara driver’s throne, so I pretty much left it in D and used the loud pedal as the primary mode of communication with the big beast. The Jeep’s preferred hunting ground is the highway where its ride is like buttah, but throw a few twisties at it and the big Jeep starts to complain- pushing hard and scrubbing off all that glorious speed the hemi under the hood has provided. 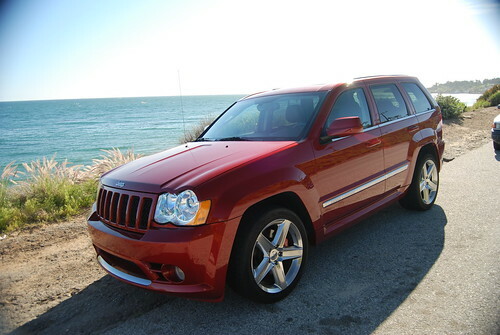 If the Jeep SRT8 were a beverage, it’d be Everclear, the power is that intoxicating, and driving it provides such a head-clouding kick. Tim: I cannot disagree. First time I heard it fire up, I was brought back to high school, remembering 15″ subs bumping the opening to Outkast’s “Wheelz of Steel”. I thought the FX made good noises, but the Jeep takes its lunch money in the audio department for sure. But, just like the typical lunch-money taking bully, the Jeep cannot dance. Any particularly engaging set of twisties was followed by a wait for the Jeep to catch up. Not so tough now that we’re in the hills, huh? Rob: I can totally see the Jeep as the tee shirt-wearing bully to the Infiniti’s chess club protege teacher’s pet. Each seems so similar in their objective, but arrives at the goal in a totally different manner. While they both were born to eat highway miles, the FX does so with the serenity and lack of drama of a refined high-end sportster- which is exactly what it is. The Jeep, on the other hand, is like a freight train, unperturbed by imperfections in the road and resistant to tramlining despite rolling on some impressively wide meats. 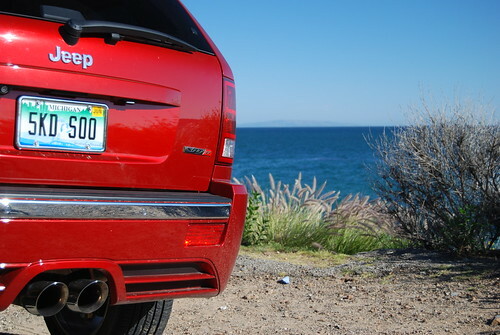 That was not what I expected from a Jeep, and it says a lot about the changes Jeep’s engineers have made to create the SRT8.